It is November 2nd and it was exactly a month ago that my wife, mother-in-law and I were driving though the Sierras heading to Mammoth Lakes, CA. We were in two different cars, since my mother-in-law would be continuing south to the San Diego area, and we would be heading back to the Bay Area after the mini vacation. This worked out really well, since I wanted to stop and shoot photos when I saw a good shot, and that was fairly often. As we cut through the Lake Tahoe area, we drove down a hill and saw our first sight of Fall colors. We both pulled over to check out the scene. There were numerous other people on the dirt road, taking photos of the colors, but I left the road and walked closer to the trees. I wanted to get closer to the trees, but also wanted to find a foreground for the photo. I saw this rock and walked to a location where I could include the rock (foreground), the trees (mid ground) and the sky (background) in one frame. I put on my Tiffen Circular Polarizing Filter to help accentuate the colors in the trees and sky. All of this was packed in my ThinkTank backpack. About a half hour later, I was on my own, driving towards Mammoth and looking for more Fall colors. I came up a crest and saw these colors off to my right. I pulled over and took another shot. What I liked about this image, was the inclusion of both the Fall colors and the mountains in the distance. As you can see, we were driving just ahead of an oncoming storm, and so I had cloudy skies. I would have preferred deep blue skies and puffy clouds, but this is what I had. The advantage is, I did not have any harsh shadows to deal with. As always, I made sure to capture the wide shot, and then zoom in to isolate some of the details. I love the layers of colors, with green in the back, yellow in the middle and grey in the front. But hat makes this image most interesting, in my opinion, is this one dark tree popping out from all the yellow trees, purposely positioned off to the right of the photo. Dramatic skies over a grove of trees. Once again, I took wide shots and tight shots. For this image, I took the photo into NIK ColorEfex Pro and added an Bi-Color effect to the trees. Although it is not historically correct, I really like the photo nonetheless. I took this photo for two reasons. Firstly, I liked the symmetry of all the tree and branches. And secondly, I wanted to show all of you that there is beauty in the trees, even without the colorful leaves. A couple of days later, we went on a hike and saw some amazing views. As you can see, we had beautiful blue skies at this time. It so pretty with the colorful trees in the valley, with these majestic snow laced mountains in the distance. I hiked further up the path and found this group of flowers. Just like the first image of this blog post, I was looking for a strong foreground, and these worked perfectly. I also zoomed in to the flowers and and made them my subject for this shot. When hiking back along the Aspen lined creek, I looked up and saw the sun peeking through the trees. I changed the camera settings to f/18 and moved to where the sun was just barely visible through the trees, which accentuates the starburst. 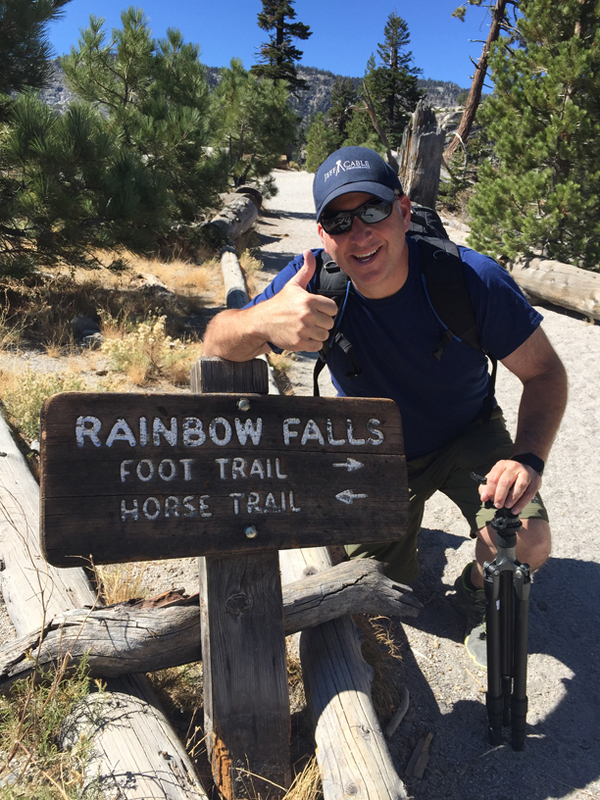 On our last day in Mammoth, my wife and I decided to hike to Devils Postpile and Rainbow Falls. As we made the drive into the park, we stopped to photograph the Minarets. It was a short hike from the parking lot to Devils Postpile. I had been here a couple of times in the past, but never photographed this National Monument. Using the Canon 28-300mm lens at 28mm, I got down low to the broken columns of Basalt to make them larger in the photo. doing this makes it easier for you, the viewer, to see the awesome columnar shapes of these rocks. I climbed up another rock formation to get as high as possible to photograph Devils Postpile straight on. And then...we continued our hike towards Rainbow Falls. And this time, we made it! You see...last time we did this hike (about 7 years ago), I ended up rolling my ankle and breaking my foot half way down the trail. I had to be taken out of there on horse back. That sucked! But this time, all was good and I made it to the falls, camera, tripod and all. My wife took this photo to commemorate my success this time around. 1. It helps cut out the glare off of the wet rocks. 2. The filter cuts out some of the light, which means that I can get a slower shutter speed. Using the filter and changing the settings of my camera to ISO 100, and an aperture of f/22, I was able to get a shutter speed of 1/4 second. Considering that I had a lot of light in the sky, getting a slow shutter speed (to show the movement of the water) was a challenge. I looked closely at the waterfall and tried to find the most interesting movement of water. I then zoomed in tight to 300mm to isolate just that area of cascading water. Since I did not have any sky in the frame, I was able to get a shutter speed of 1/2 second for this photo. I hope you enjoyed my view of the Sierras. It was a really great 3 days of rest and a chance to get out and breathe the fresh air. Yes, it is true...my version of resting is breaking out the camera and shooting for myself. It is not just my job, it is my passion! Early in my career as a videographer I worked with a producer that said The wide shot is the noun, the medium shot is the adjective and the cu is the adverb. It may not be a 1 to 1 correlation but it served me well for a 38 year carer in video. Now that I have rejuvenated my still photography soul that advice still seems pertinent. 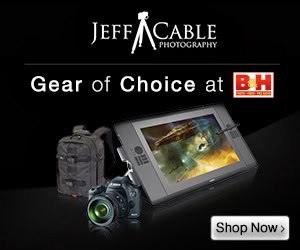 Jeff, I can't see the icon to sign up for your newsletter or blog announcements. Are your newsletters all stashed somewhere that I could peruse old ones? Thanks for sharing your photos, I am in San Jose and it is nice to see the local photography! What a beauty you captured and shared with all of us...truly amazing...all the very best...! !